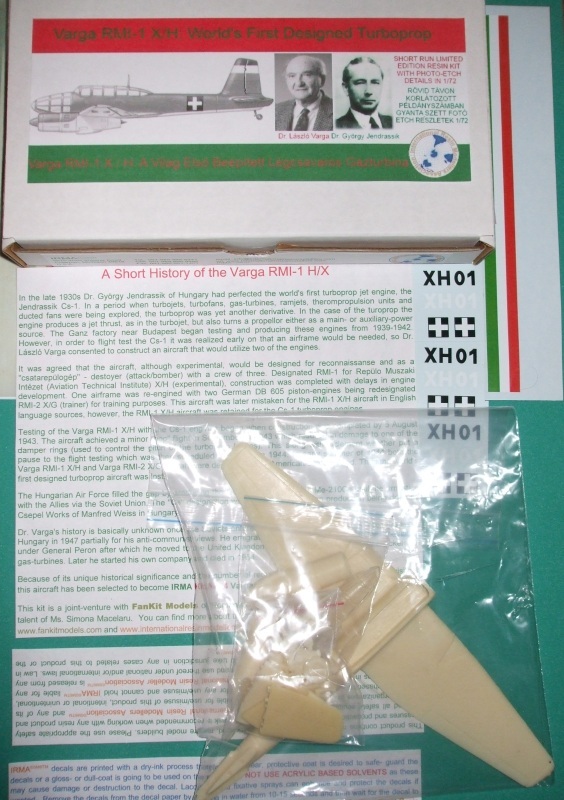 In your Varga RMI-1 X/H kit you will get the standard IRMA box which contains the resin kit with metal detail parts, a history of the aircraft, color instructions, a Certificate of Authenticity and disclaimer and decals. This kit was moulded for IRMA by Simona Macelaru of FanKit Models and is another fantastic quality model as only she can do! As this is a larger kit than others IRMA has done so far, the box and contents will be a bit bigger. Wash parts in soft detergent bath to remove any resin release residue. Clear resin parts will come out cloudy at first. Let them dry overnight and they should be clear by morning. Sand down any rough areas with soft sand paper or cloth. Sand or file any excess flash or mold holding parts. Once parts are prepared test fit each one before assembly and gluing. Use gel initially as this gives more time to position the parts. When in position add a drop of liquid glue to hold parts firmly. Start by gluing tail fin (part 10) to fuselage (part 1) making sure to align pinholes with pins. Then glue rudder (part 9) to tail fin and fuselage. 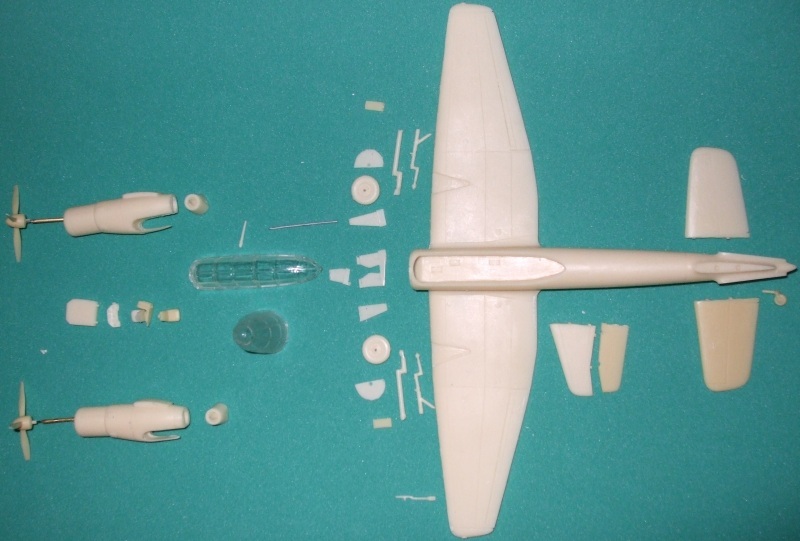 At this point you can also insert tail wheel (part 14) into fuselage. Moving to the front of the aircraft, make sure engine nacelles are fitted for proper sides of main wings-starboard and port. If you wish the propellors to rotate, then drill out the hole in the center to the end and glue the correct size wire to the back of the propellor hub. Glue or insert starboard propellor (part 6) into starboard engine nacelle (part 2) then attach starboard engine exhaust (part 3). Glue or insert port propellor (part 6) into port engine nacelle (part 2) and attach port exhaust (part 3). 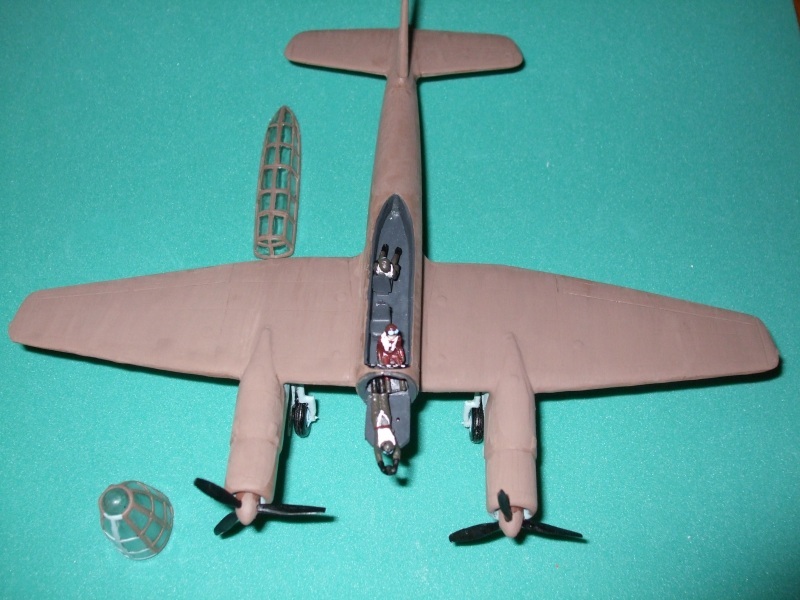 Attach completed engines to starboard and port wings on fuselage (part 1). Next glue starboard landing gear leg (part 16) to inner landing gear wheel well on starboard wing (part 1). Attach starboard main wheel (part 18) followed by starboard middle landing gear door (part 21). Once in place attach starboard upper landing gear door (part 22) and align as in front view of drawing. Next add starboard inner landing gear door (part 17) then starboard lower landing gear door (part 20) again aligning with drawing. For port landing gear, repeat process attaching port landing gear leg (part 16) to port main wing wheel well (part 1). Next glue on port main wheel (part 18) followed by port middle landing gear door (part 23) then add port upper landing gear door (part 24) and align with drawing. Then attach add port inner landing gear door (part 17) and port lower landing gear door (part 19) again following drawing. If bracing wire is desired, attach starboard bracing wire (part 25) and port bracing wire (part 25) as shown in the drawing. For the cockpit start by attaching the observer’s platform (part 11) to the front of the fuselage (part 1) aligning pins with pinholes. Next add the control panel (part 15) inside of the cabin. Insert pilot’s seat (part 12), observer’s seat (part 12) and navigator’s seat (part 12) facing the rear. 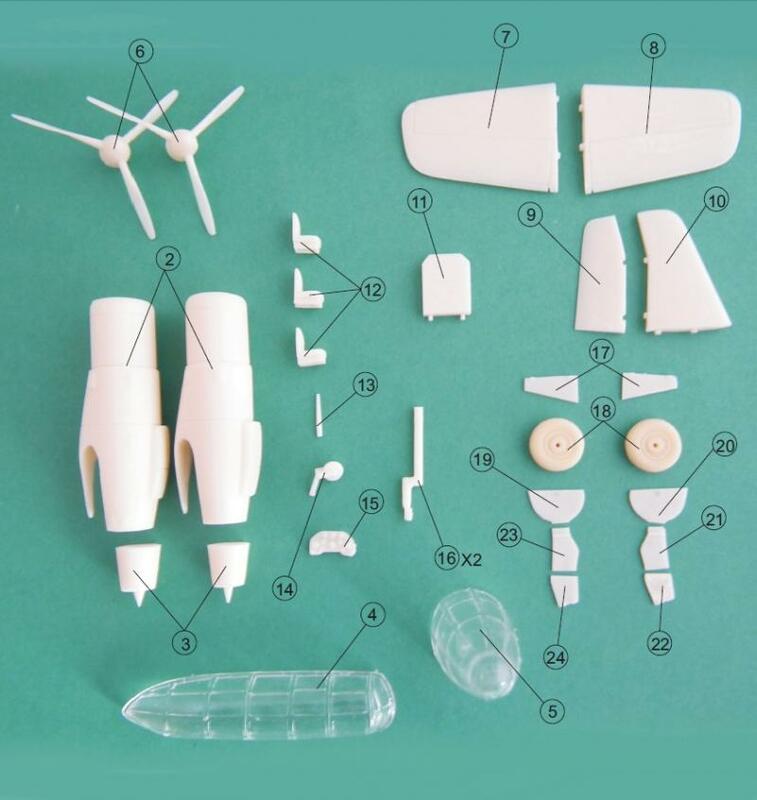 For additional details such as the pitot tube, control stick and antenna wire, different sizes of wire, sprue or resin can be used. Please see photos and drawings for details. At this point the aircraft should be painted or at least the interior as the canopies will be added next. Also, if you wish to add pilots, this is the point to do so. Attach the nose canopy (part 5) aligning the pins to the fuselage (part 1) then glue on the cabin canopy (part 4) adding the antenna (part 13). Pitot tube goes on the port wing just inside the end seam (see photo above). 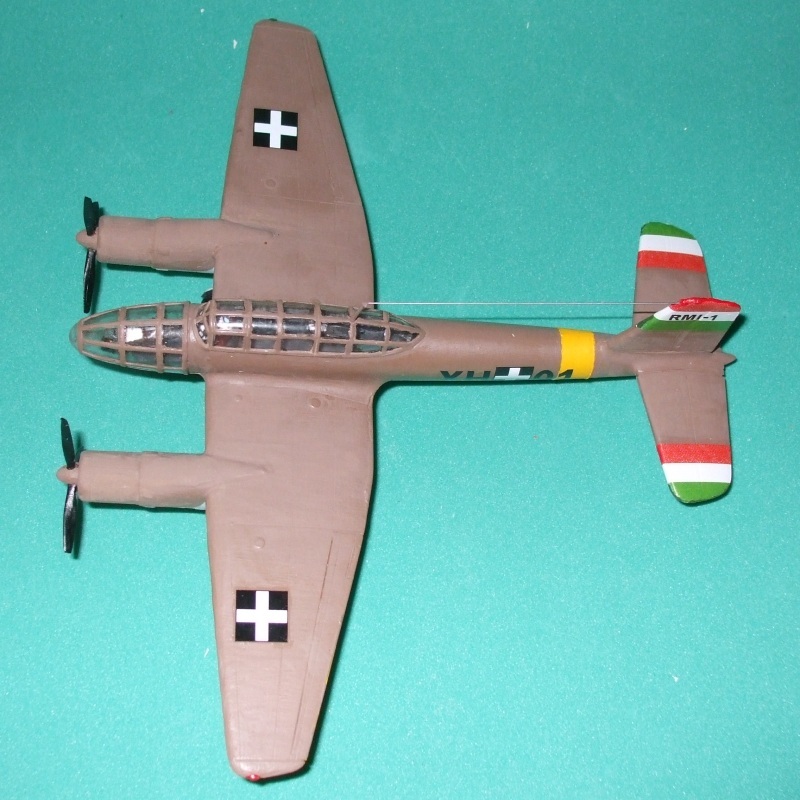 In most cases the underside of Hungarian aircraft carried a light blue similar to or identical to that used by the German Luftwaffe. Wheel wells appeared to be dark gray or almost black as well as the cockpit interior. Struts were the same color as the underside while wheels were light blue. 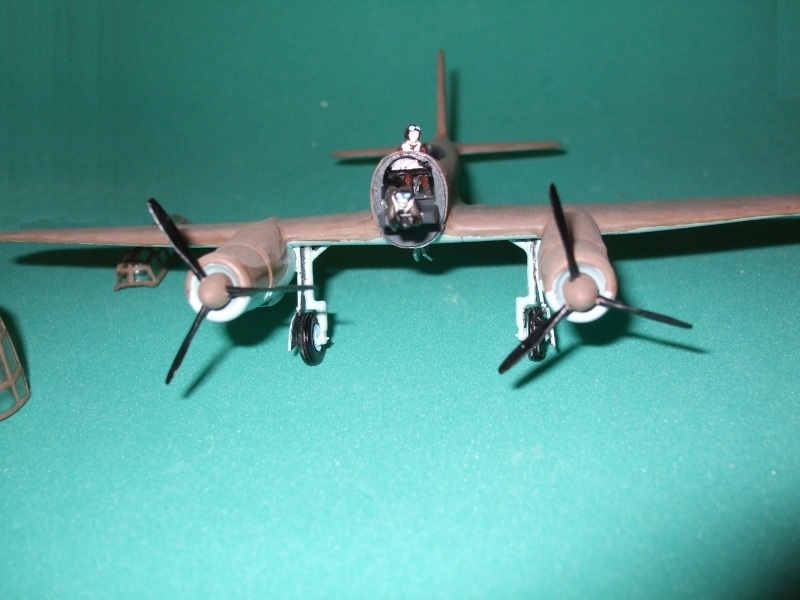 In most illustrations the topside for the Varga RMI-1 is done in an olive brown or similar paint scheme. 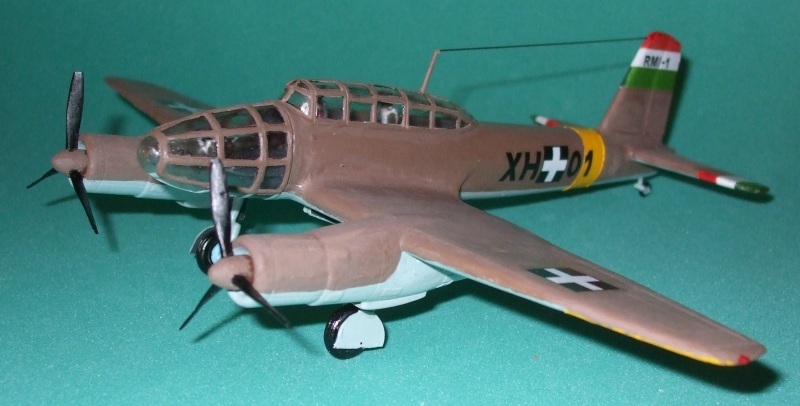 Most likely their would also have been a yellow band on the fuselage and yellow underside wing-tips as an Axis participant, especially in the invasion of the Soviet Union. 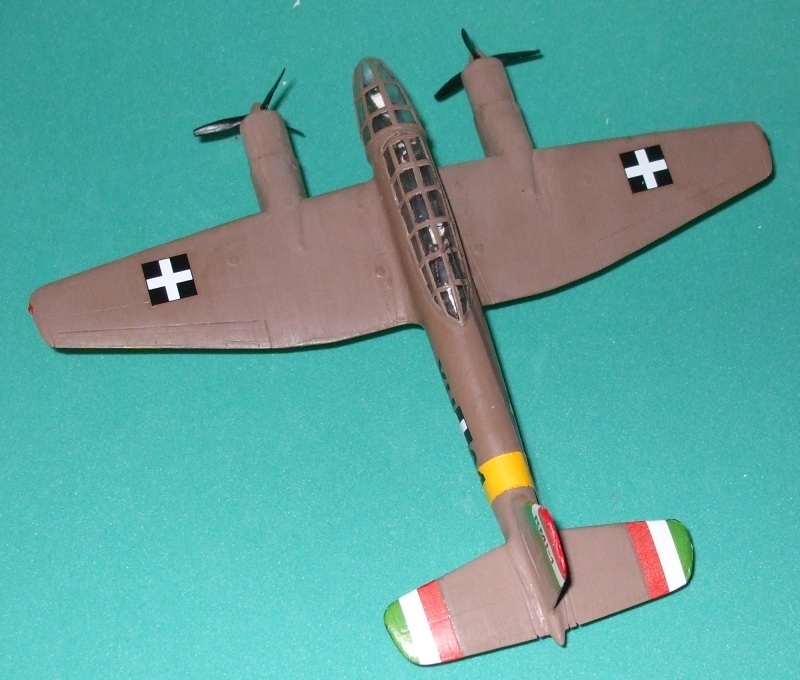 Propellor hubs and blades appear to be all black for most Hungarian aircraft of the period. However, there may have been variations on the propellor hubs at least as many photos show them the same color as the topside. 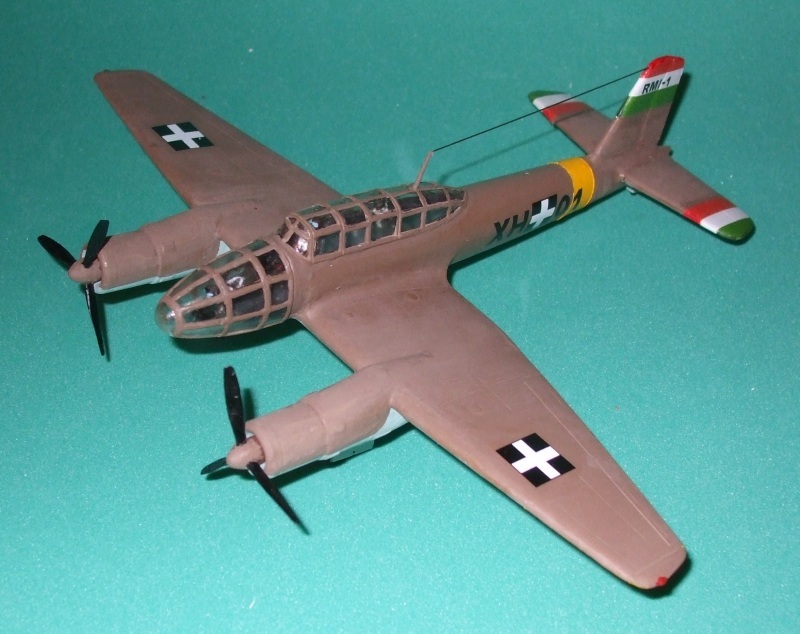 If you wish to add pilots, most likely Hungarian pilots wore flighsuites similar to their German counterparts. In the case of Hungary, the commander wore a red-brown flightsuite while the rest of the crew wore a khaki-green. This secenario appears to have been standard from the information we could find. For the "dusty" or "weathered" look in the photos, first paint the overall coat of olive-brown or earth, making sure it is a flat type of paint. In this case Tamyia was used (Flat Earth XF-52) then after a second coat of the same, a mix of 8 parts water with 1 part light blue and 1 part flat earth was lightly brushed over the top-side to give a "used" appearance. Note too that the propellor hubs directly behind the blades are left in the original brown as the turboprop engines would have acted as a vacuum for any dust in these locations. On the bottom side of the wings only a very, very light discoloration would have been visible from the engine exhaust (not too visible in these photos). 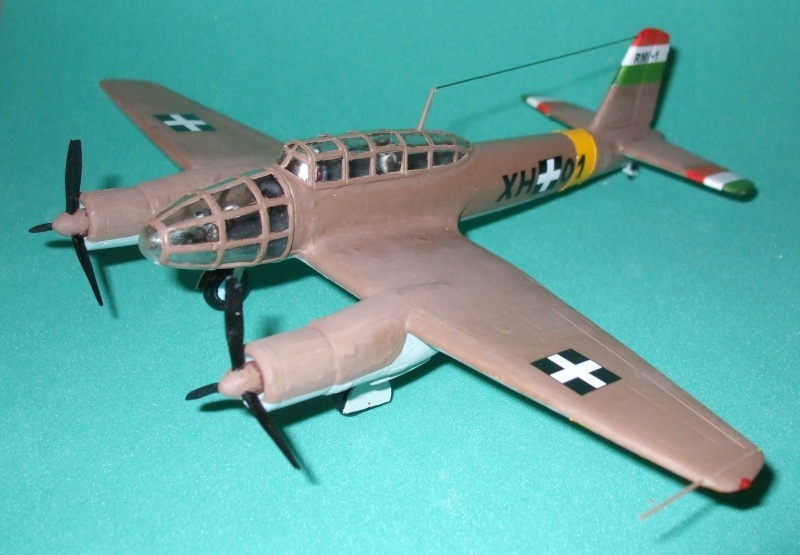 Place the white-on-black crosses either side of the fuselage as indicated in the box art with either the black code letters or white, depending on which color(s) you paint your bird. For the wings, place the white-on-black crosses about 2 centimeters from the outside tip. 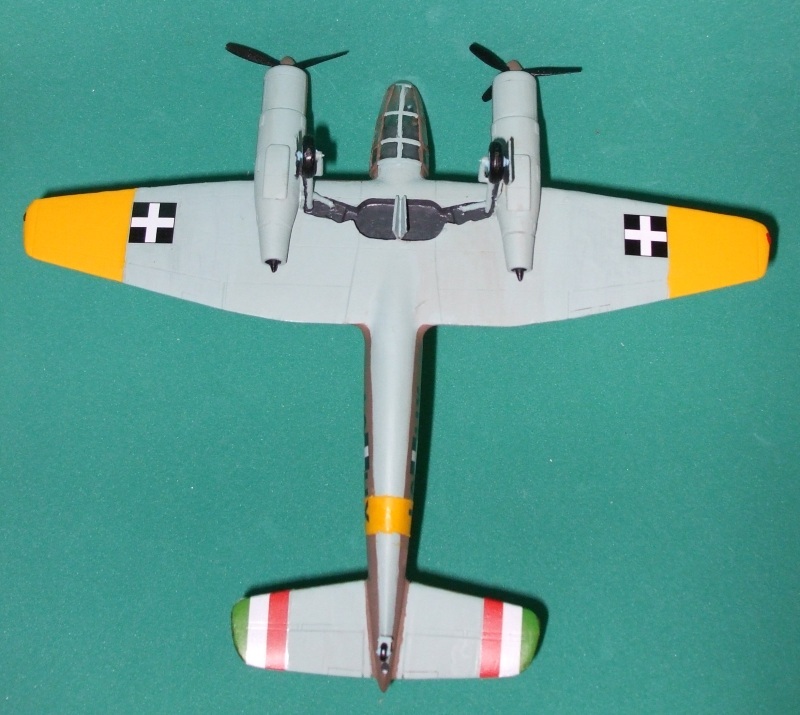 Typically the Hungarian crosses bordered the yellow Axis markings underneath the wings. Also, as an experimental aircraft the RMI-1 may have carried the code letters underneath the wings on each side. If you choose to do this version, there are extra decals for this as well in both black and white. For the red-white-green stripes that go on the tail fin and tail planes, the red goes on the top and outside with the green below and to the inside, just like the flag of Hungary. If you wish the propellors to rotate on your kit, here is a way to do it. Take a 3/64" drill bit and locate the holes of the same size in each engine nacelle and with your trusty rotary tool or pin-vice, drill about 1/2"-1" into the opening. Next take a 1/32" drill bit and very carefully drill about 1/4" into the shaft on the back of each propellor. Be sure to keep the shaft intact so the propellor will center itself in the hole. Next take a 3/64" wire and insert it into the entrance now on the propellor to test fit. Then glue this in place. Cut it off at about 9/16" and not shorter! 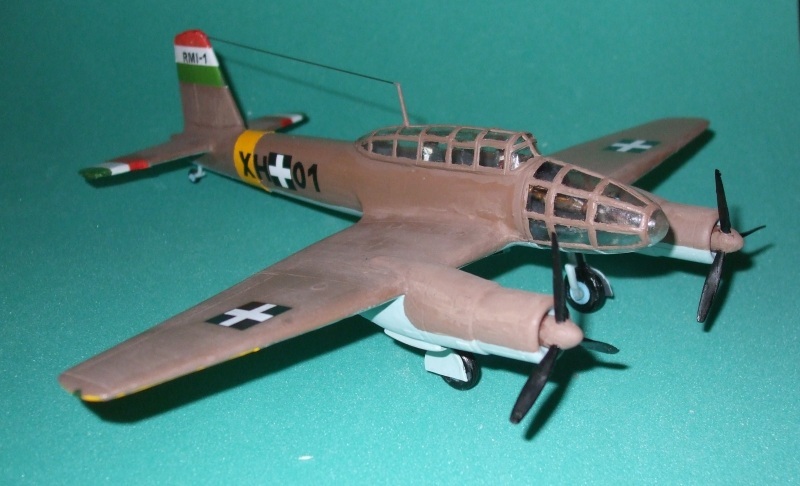 Now take a 1/32" hollow tube of brass, aluminum or copper and cut this off at 1/2" and insert the propellor shaft so that 1/16" of the 1/32" wire is sticking out. Then bend the end of the shaft, the last 1/16" at a 90° angle, so that the propellor is fixed to the 1/32" tube. Final step, insert the whole thing into the engine nacelle and you have a rotating propellor! Now, if you want the main wheels to move get your 3/64" drill bit again and hollow out the center following the holes already made. Follow through with the same procedure on the main landing gear legs. When finished, take a 3/64" nail and insert it through the hub of the wheel then put a tiny drop of glue on before inserting it into the main landing gear. If the nail is too long, just grind it down to match the back surface of the landing gear. You should end up with rotating wheels! If you see any gaps in this article or know of details we have left out or that are incorrect, please contact us! We are always striving for historical accuracy and welcome new facts, additional data or corrections.